Interpine has recently released for industry testing an on-board harvesting specific navigation system to improve productivity and safety for machines operating in medium to steep terrain. The focus of this project was to produce a stability prediction system which couples with real-time GPS sensors and gyroscopes providing operators with actual and projected machine slope. This is combined with a warning system to provide audible and visual alerts for actual and predicted slope, current roll and pitch of the machine, and incursion into exclusion zones (riparian or environmental buffers) for the machine operator. The focus was deployment on low cost consumer tablet style devices which have inbuilt GPS and gyroscope sensors (although external sensors can be used). This hopefully will enable wide adoption across the industry to help improve safety and reduce environmental impact of forest harvesting operations. The system really benefits from the detail which LiDAR aerial survey captures in terms of the resolution of terrain features, for those that have this type of data. Operator can add custom waypoints and danger zones for future reference. Dell Latitude 10 Tablet with GPS and Gyroscope. ~16hr Battery Life, although can be plugged into machine power supply. 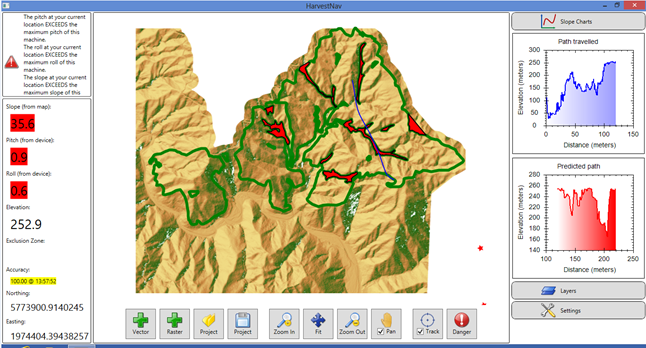 The software is free to Future Forest Research Ltd (FFR), Harvesting Theme members. It is envisaged that the software will remain freely available with paid support or installation if required. This is to encourage wide adoption of these types of devices and software throughout the industry. Interpine and FFR see this an enabler for future deployment of innovative systems into the harvesting environment to increase safety and reduce environment impact while providing for efficiency gains in productivity. Once testing has been completed by members and their contractors as part of the deployment and testing phase, we hope to offer this more widely in the industry. If you would like more information on this system or arrange for it to be tested in your operations, feel free to contact us.